LOWER MANHATTAN — World Trade Center survivors will have a chance to visit the 9/11 memorial after all — just not on the anniversary of the attacks. The World Trade Center Survivors' Network announced Sunday that they have secured group passes for 75 people to visit the memorial on Sept. 12, one day after the official commemoration ceremony. They got the passes through the 9/11 Memorial's free group reservations online system, after many of the individual passes for the anniversary week had already sold out. Survivors learned last week that the city would not allow them to attend the commemoration ceremony itself, as they have in the past. The city is limiting the ceremony just to victims' family members this year, based on space concerns, a spokesman said last week. WTC Survivors' Network leader Richard Zimbler told DNAinfo Monday that city officials had not compromised on their decision to exclude survivors from the 9/11 anniversary ceremony. "Obviously, we are glad we were able to get tickets for the 12th, but it doesn't make our disappointment in not being able to participate in the official ceremonies any easier," he wrote in an email. "After all, we are trying to participate on the 11th to honor our dead colleagues and coworkers — not get free passes to the memorial." The WTC Survivors' Network told members in an email Sunday that because of the 75-person limit, "unfortunately…we can't guarantee passes for everyone." They did not say how the passes would be distributed. The mayor's office, which is in charge of the commemoration ceremony, did not immediately respond to requests for comment. The announcement of the Sept. 12 gathering did not soothe survivors who were still upset about being left out of the official ceremony one day earlier. "Since the politicians in charge have not granted survivors any greater status than tourists, my family and I feel it would be best to visit the memorial at a time when things are not so politically charged," Shannon Loy, 38, who escaped the burning Twin Towers on 9/11, wrote in an email. 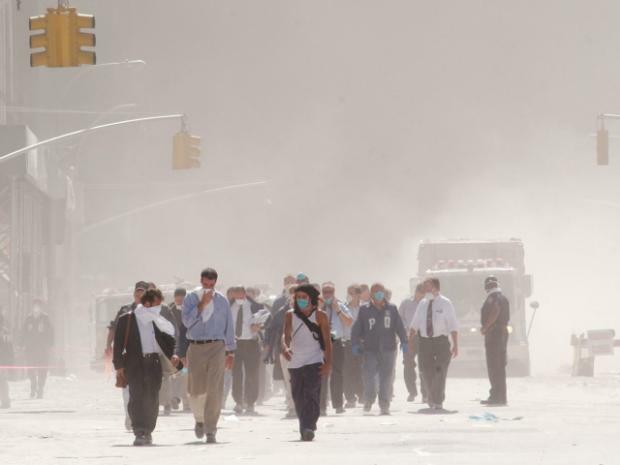 Loy, who developed breathing problems after her exposure to the toxic dust following the Trade Center's collapse, had planned to make her first trip back to lower Manhattan on the 10th anniversary of the attacks. But she said that unless the city allows survivors to attend the official ceremony on Sept. 11, she will mark the anniversary at home with her family in North Kansas City, Mo. An online petition Loy started earlier this summer has collected more than 750 signatures from people who want survivors to be included in the anniversary ceremony. People continued signing the petition and protesting the city's decision even after Loy posted a note on Sunday announcing that 75 tickets are available for Sept. 12. "I understand that the space is limited, but after all they have been through this is really a slap in the face for these survivors," one petition signer posted Sunday evening. "How about you keep out the politicians and the media, and make a little room for people who REALLY deserve to be there…. Make us proud to be New Yorkers again, and find a way to include ALL of those who were so deeply affected." The WTC Survivors' Network is asking survivors who want to visit the memorial on Sept. 12 to RSVP to contact@survivorsnet.org by Aug. 10. The group has not announced how they will handle the requests if they receive more than they can accommodate.